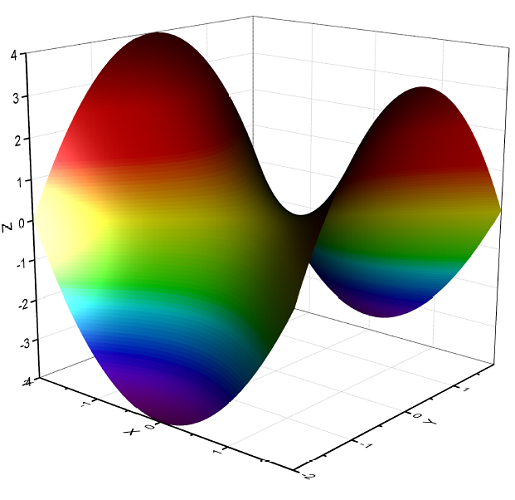 This graph displays a hyperbolic paraboloid created from a virtual matrix. Data in a virtual matrix worksheet is arranged as in a matrix sheet, and can support both linear and non-linear mapping. 3D Surface and Contour graphs can be plotted directly from virtual matrices. The data contained in this worksheet is arranged as in a matrix. X coordinates are stored in the first row and Y coordinates are in the first column. The remainder of the cells contain the Z values. With the worksheet active, click the 3D Surface or Contour button to open the plotvm dialog. In the dialog, specify Z and XY values to plot.